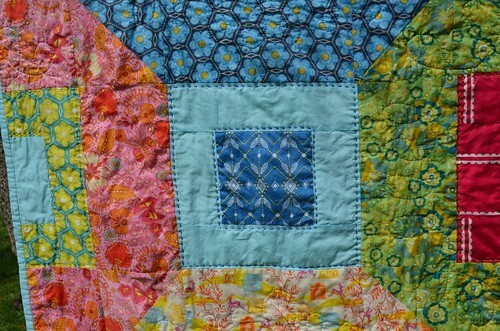 Yesterday I finished hand sewing the binding on my Orbit Quilt from Lindsey's Orbit QAL! Woohoo! I was a little worried about how it would fare in the wash, but so far all seems look perfectly intact. And it is perfectly snuggly, soft! I used perl cotton to hand quit around each small square. Since I wasn't sure if this was enough quilting to keep the batting in place, I also did some free motion swirls around each orbit in a light gray thread so it wouldn't show up too much. I was considering making one big orbit for the back, but this log cabin style ended up suiting the remaining fabrics better. I am really glad I stuck to voile for the whole thing. All are from Anna Maria Horner Little Folks collection and the binding and background blue is voile solid in Water, also from Free Spirit fabrics. I wish more designer's had lines available on voile! 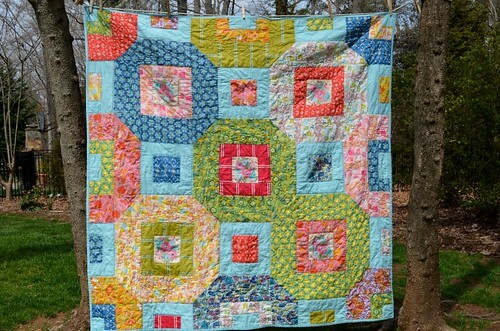 I am going to have a hard time going back to quilting cotton after this one. 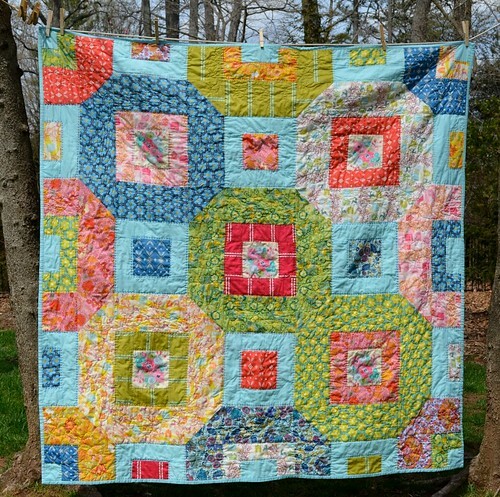 Be sure to check out the other Orbit quilts in the linkup - there are some beautiful quilts! I got the pleasure of meeting Lindsey at Sew South last weekend and she is even more amazing in person! You did a great job on this! Oh it is just beautiful Courtney! I love it. 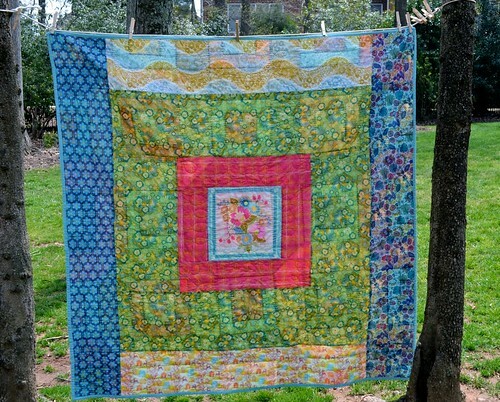 It really makes me want to cut into my voile stash and make a quilt too which has been on my to-do list FOREVER!